Today is such an exciting day!! I am super happy to announce that I’ve partnered with Hazel and Ruby on a craft kit in their Holiday Crafternoon line! Hazel and Ruby has put together this fun line of Crafternoon kits – cute projects that you can make in a few hours. They released their first line of the kits a few months ago, and this week they are launching their Holiday kit line! I am so fortunate to have a kit in the line! You might recognize these fun hoops – I posted about them last year. 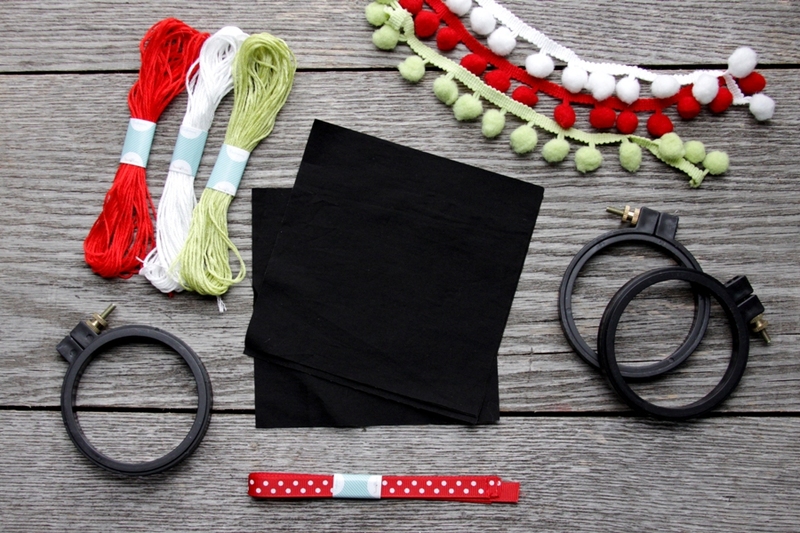 The Crafternoon kits make it super easy to put them together though – everything you need comes in the kit! There is an instruction page in the kit and there is also a step-by-step video that walks you through every part of making the ornaments. Stitches and all! The kits are being carried at Jo-Ann Fabric and Craft stores – online and in most stores. You can call your local Jo-Ann store to see if they’ll have the kits. You can find mine online right here! This is so crazy awesome!! I’m pinching myself. 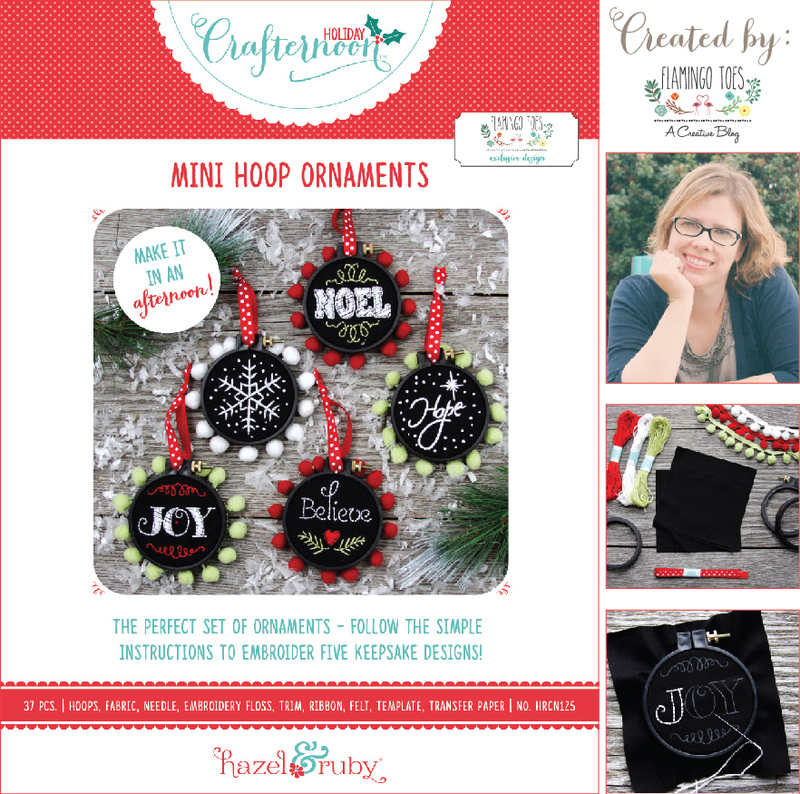 There are so many great kits in the Holiday line – 10 in all! Make sure you check them all out – you can see them at Hazel and Ruby. There will be links to all the bloggers that have created kits – here’s a peek at them all! If you pick up any of the kits I’d love to hear about it – and make sure you check back next week! I’ll be having a giveaway for my kit! My congratulation to the cooperation with Hazel&Ruby. What a nice crafting kit!! Because I’ m living in Germany, the Shipping is much too expensive for me. I let myself be inspired by your great DIY. Love these….We ordered some. :) The kids and I have been looking for a craft like this for a while! Thanks for sharing with us! Oh yay Heather – thanks so much! Did you see the little house kits? The girls would have so much fun sewing those up! http://www.joann.com/hazel-ruby-crafternoon-house-pillow/14552251.html#q=crafternoon&start=3 The videos really make it easy too! I just bought this. Can’t wait for it to come in the mail. I have bookmarked your blackboard embroidery before and never got around to doing them. With this kit I know I will finally accomplish it. Thank you. These are so adorable!!!! The mini hoops have me smiling from ear to ear!!! LOVELOVELOVE it!!! TFS! Wow – these are great! They bring back memories of my Mama & I cross stitching when I was young. CONGRATULATIONS on having your CREATIVE IDEA transformed into a FABULOUS kit!!! I have so many precious memories of learning to sew with my Mother & Grandmother and think this would be a WONDERFUL kit to do together with my nieces, practising a LIFELONG SKILL and finishing a HANDMADE ornaments to keep at the end of the day, I can see these being hung year after year => AWESOME!!! This is so lovely! Stocking are a huge part of Christmas here-and my youngest is 31! This would be perfect for my beautiful DIL-and I know she would treasure it forever. I am truly blessed to have a girl in my family who shares my passion for homemade and tradition. These are so so so sweet! I can’t wait to make them. Great project idea! I love this project!!! Pinning and putting on my to do list. Thanks for the tutorial. Adorable!!! Pinned to share on my Holiday Decorating board and to show my daughter who I’m sure would love to make these for her feline proof Christmas Tree. You are so talented and these are just perfect! Congratulations! 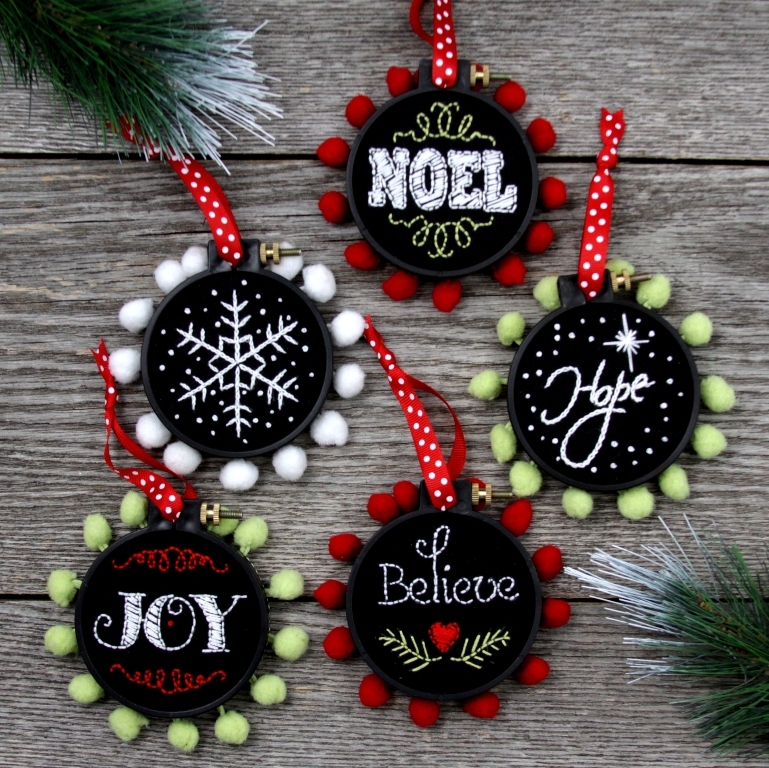 Bev, just a quick note to let you know I’ll be featuring your fabulous chalk ornaments this weekend at the DIY Sunday Showcase Party! What exciting news, they are gorgeous. You are so full of lovely ideas! I can totally see myself working on these. I am in love with the quickness of them! Cute Idea. Pinned & shared. Thanks for joining the party. Cute Idea. Congrats! Pinned & shared. Thanks for joining the party. 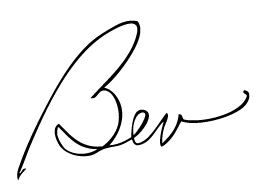 Hi Bev, It seems I’m a day late and a dollar short, so to speak, as I just now found the Chalk Embroidery ornament on Pinterest and I went to your site to purchase the kit. I see you designed these in Nv. of 2014. Oh my gosh how cute they are! Do you have any kits left and/or know how I can purchase one? You’re welcome to contact me at my email address at craedavis@verizon.net if that works for you. I would truly appreciate your comments on this. Thank you!